What's On your Big Screen! 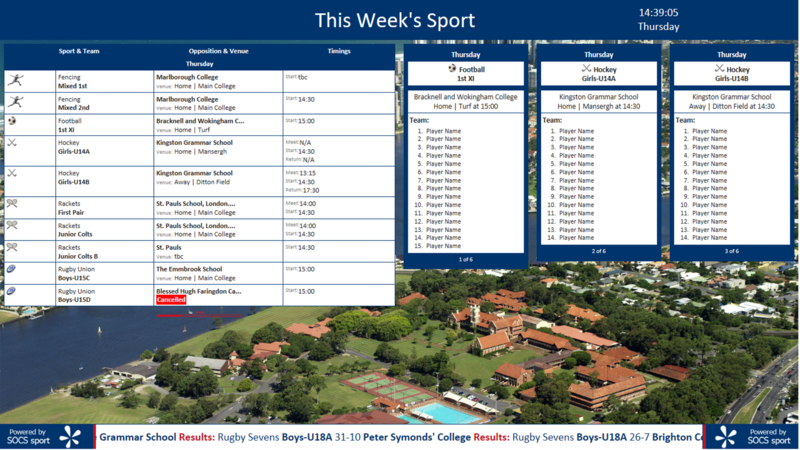 Designed for large screen displays in sports halls, corridors and reception areas, the Big Screen includes features such as the upcoming sports programme, today’s teams and latest results and news. Big Screen will show the upcoming sports programme for the current week on the left hand side, and published team sheets scrolling on the right hand side. The information displayed on Big Screen is updated directly from your SOCS control panel. Big Screen auto updates every 10 minutes, so any changes you make via your SOCS control panel will be visible on the Big Screen automatically within 10 minutes. Information during the week for days in the past are not included – therefore on a Tuesday, the Monday information will drop off etc. etc.. This reduces the number of pages, team sheets as a week progresses. Big Screen is designed to be viewed on an internet browser (connected to the internet) in full screen mode (Internet Explorer 9 or above) on a TV or monitor with a resolution of 1920 x 1080 pixels. A typical setup would be connecting the screen to a PC/laptop using an HDMI cable. Ensure the web browser on the device you intend to use, particularly built in web browsers on Smart TVs, support a screen resolution of 1920 x 1080 pixels in full screen mode. Also, make sure to turn off all Browser menus and the status bar. When reviewing Big Screen on a PC or laptop with a lower screen resolution than 1920 x 1080, Big Screen will overflow off the edges. In order to see all the content you must scroll around. For more details about pricing and to order send an email to sales@miSOCS.com. Pricing does not include the price of the HD TV or installation.